Oh bother. Forget about the bear. Christopher Robin has. Christopher has no time for such childish things these days. He can't be bothered with honey and heffalumps, tea parties and pinned-on tails. He's an adult now, with a job and a family. Madeline, Christopher's young daughter, is just a bit older than Christopher was when he played in the Hundred-Acre Wood with Piglet, Eeyore, Tigger and the rest. He was the 6-year-old hero who'd save them all from wind and high waters, and pulling Pooh out of rabbit holes when he ate too much honey. But Madeline has no time for such nonsense, Christopher feels. Not with boarding school just a few weeks away. She must learn her arithmetic and keep up with her reading. She must work hard to succeed and excel in a bitter, brutal world. The Hundred-Acre Wood is closed to traffic now, and Christopher Robin has no time to visit it. But Pooh loved Christopher Robin just as much. Maybe more. So one foggy, soggy day, when he wakes up and finds the Hundred-Acre Wood empty of his friends, he has just one thought: "Christopher Robin must help me find everybody," he says. "Or help everybody find me." London. Noisy, smelly, grey London, where a man clutching a briefcase filled with Very Important Things sits on a park bench and worries. Alone. Pooh recognises Christopher Robin immediately. He's just the same, underneath the wrinkles and care. It's time to renew acquaintances. Pooh believes that he's lost his friends. But who is really lost is Christopher Robin. He's lost his way, his sense of priorities, and he's slowly losing his family, too—a wife and daughter who are floating past him like a twig in a river. But Pooh shows Christopher that his briefcase filled with Very Important Things is still not as important as his daughter. He reminds him that sometimes the best way to spend one's time is in doing nothing. He tells Christopher that there's still a place for childlike whimsy and fun in an oh-so-adult world, that sometimes a red balloon can brighten the greyest of days. Christopher Robin also emphasises that it's best to have someone else along for the walk too. "Pooh to me doesn't just profess a philosophy about taking time and making time to just sort of do nothing, meaning doing your favorite things," Christopher Robin producer Brigham Taylor said in an interview with Plugged In. "He's also about doing those things together. And we always see Pooh not just as a solitary figure, but as someone who is holding the hand of his friend Piglet, or playing with Christopher. It's about togetherness." 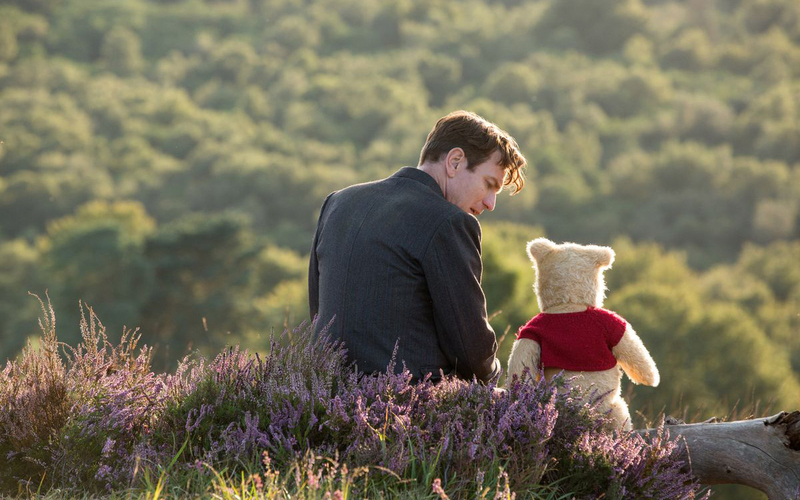 It's not that the concerns of our adult Christopher Robin are simply forgotten. Those are real concerns. And when Christopher's Very Important Things (papers for a critical cost-cutting briefing at work) find their way out of his briefcase, daughter Madeline and Christopher's cadre of childhood pals go to some incredible lengths to get them back to him. Christopher Robin doesn't dwell on any magical alchemy that brings Pooh et al. into Christopher's adult world. While the film suggests that maybe a little spilled honey on one of his old childhood drawings could've awakened Pooh after a multi-decade nap, the bear's relative liveliness (and that of his friends) is simply a given in the movie's narrative construct. Christopher Robin is a veteran of World War II, and we briefly see him in battle, with explosions detonating around him and fearful soldiers diving for cover. Later, he returns home with his arm in a sling. Denizens of the Hundred-Acre Wood quiver in fear at the thought of heffalumps and woozles, and there are some momentarily tense heffalump-related scenes. When Madeline learns from Hundred-Acre Wood denizens that her father doesn't have his papers, she and they leave the family cottage in Sussex and make their way to London, alone—not an adventure you'd want your little ones emulating. Christopher Robin takes a lot of license with A.A. Milne's characters. It takes them off the page and plops them into our reality, rendering them as living creatures in a real-world environment. Yet, the movie captures the spirit of the original stories. The fun, the humour, the unintended wisdom, and especially the bittersweet melancholy. Christopher Robin is a fun movie for kids. On one level, it's a light, spirited adventure story. On another level, it was made for us too, adults who fret about our own Very Important Things. It reminds us that our children are to be treasured, and sometimes the most important way to spend one's time is to do nothing important at all, with the ones we cherish most.